The budget implementation bill contains measures that amend dozens of laws, repeal some entirely and enact new ones, which has prompted the opposition to call it a "kitchen sink" and "Trojan Horse" bill. Here's a closer look at what can be found within its 450 pages. 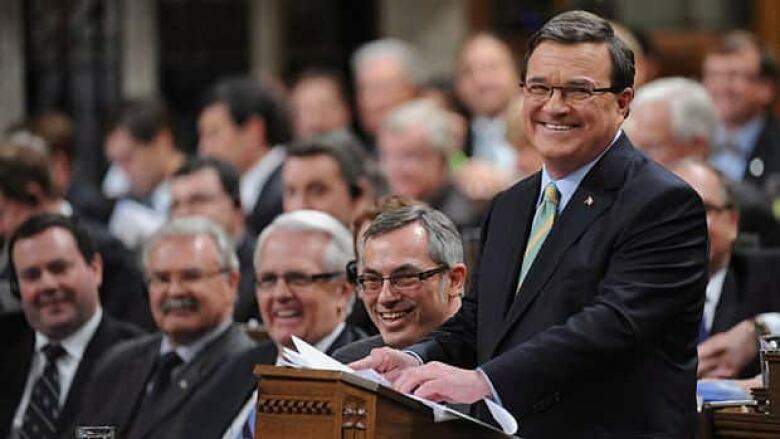 Finance Minister Jim Flaherty presents the federal budget in March, with some of the many ministers whose departments are affected by the budget implementation bill in the background. The Conservatives' spring budget made headlines two months ago with plans to save billions by cutting public sector jobs, speed up major industrial projects by streamlining environmental reviews and kill the penny. But details of those and many other changes are still trickling out as Parliament picks apart the legislation meant to implement the budget's promises. Bill C-38 goes beyond tax and monetary measures to make major changes in dozens of policy areas, including the environment, natural resources and human resources. It seeks to amend or create dozens of laws, while repealling others entirely, and has been called an omnibus bill as a result. The opposition is incensed with the size and scope of the bill. The NDP tried — unsuccessfully — to negotiate with the government to split it into smaller bills. Finance Minister Jim Flaherty says it's big because it was a big budget and the measures are needed to create jobs and grow the economy. The opposition parties say they shouldn't be asked to vote on legislation that lacks specifics and grants cabinet the power to make regulatory changes. Bill C-38 has passed second reading and is now being studied by several Senate committees and the House of Commons finance committee, while a finance subcommittee is set to study the environmental review changes. Here's a look at some of the measures in the bill's 400-plus pages. It's not an exhaustive list, so be warned: there will be another budget bill in the fall. The government wants a "one project, one review" environmental assessment system, so it is repealing the Canadian Environmental Assessment Act and replacing it with the Canadian Environmental Assessment Act, 2012. It allows the federal government to designate an assessment to another jurisdiction, such as a province, and for another jurisdiction's assessment to substitute for a federal one. It sets out time limits for the completion of reviews and the minister will have the power to shut down a review panel if he thinks it won’t finish on time. Employment insurance claimants are required to demonstrate they are actively seeking "suitable work" in order to receive payments. C-38 removes definitions of "suitable work" from the Employment Insurance Act and gives the federal cabinet the power to create new regulations about what constitutes suitable work and reasonable efforts to find work. The budget bill gives no details about what the new criteria will be. It also makes changes to how payments are calculated, to pay claimants based on their "best 14 weeks" of employment. 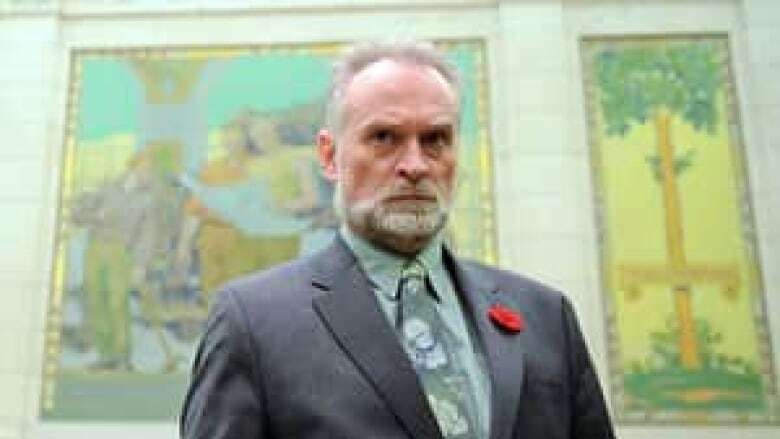 Auditor General Michael Ferguson will no longer be required to annually audit several agencies, including the Social Sciences and Humanities Research Council, the Natural Sciences and Engineering Research Council, the Northern Pipeline Agency and the Canadian Polar Commission. The agencies must submit annual financial reports to the minister instead. Finance Minister Jim Flaherty says this move was made at the request of the auditor general. C-38 proposes amendments to the Income Tax Act's rules around political activities of charities. Charities aren't supposed to spend more than 10 per cent of their budgets on political advocacy. Under C-38, donating to a charity could be considered a political activity if the donation can "reasonably be considered" to be for the sole purpose of supporting political activities. So, if one charity gives money to another charity for political purposes, it would count toward the donor's 10 per cent limit, not just the recipient's total. It also gives the minister of national revenue the power to withhold tax receipts from a charity or association if it devotes resources to political activities in excess of the limits. Among the amendments to the Immigration and Refugee Protection Act is a move to wipe out a backlog of 280,000 applications under the Federal Skilled Worker Program. Applications made before 2008 would be deleted and the application fee refunded. Legislation currently protects fish habitats that are defined as "spawning grounds and nursery, rearing, food supply and migration areas on which fish depend directly or indirectly in order to carry out their life processes." Bill C-38 would instead protect fish based on their use: bodies of water that support commercial, recreational and aboriginal fisheries or fish that support such fisheries. It rewrites the Fisheries Act's rules against work that can cause the destruction of a fish habitat. The bill also would allow the federal government to transfer Fisheries Act responsibilities to a province with equivalent laws. There is some good tax news in the budget bill. It expands the list of goods and services free of GST and HST, adding some prescription drugs and more medical devices to currently exempt items like false teeth and hearing aids. The bill would also allow literacy organizations to claim a GST rebate or the federal component of HST paid on books they give away for free. The bill increases Gov. 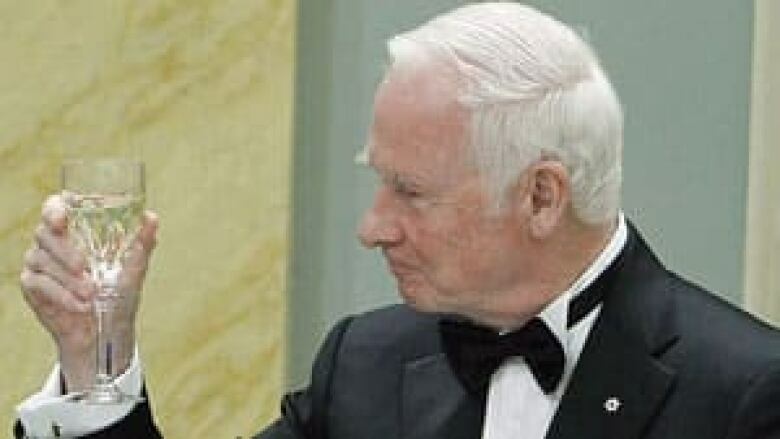 Gen. David Johnston's salary from $137,500 to $270,602 starting on Jan.1, 2013 — but he's no longer exempt from paying income tax. His salary was hiked to offset the taxman's bite. The budget bill creates a new law to implement the Framework Agreement on Integrated Cross-Border Law Enforcement Operations that was signed between Canada and the United States in 2009. It applies to joint operations between authorities in both countries on the seas. The budget bill scraps the office of the inspector general at the Canadian Security Intelligence Service. The office is meant to be the public safety minister's eyes and ears overseeing CSIS. It also makes other changes on how CSIS reports to the minister. Bill C-38 shuts down several government-funded groups and agencies, including the National Council of Welfare, the Public Appointments Commission, Rights and Democracy, the National Roundtable on the Environment and the Economy, the Canadian Artists and Producers Professional Relations Tribunal and Assisted Human Reproduction Canada. It creates a new Social Security Tribunal to hear appeals of decisions made on Old Age Security, employment insurance and other benefit programs, and creates the new Shared Services Canada Department. 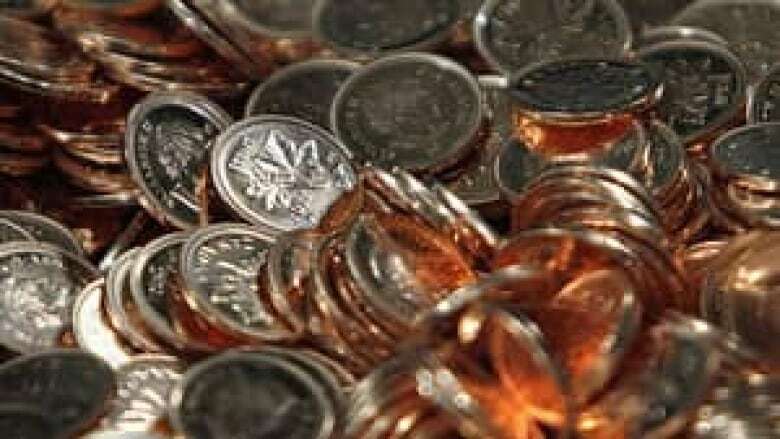 The government is phasing out the penny but is changing the law so pennies can still be used as legal tender even though they are being removed from circulation. The current law says a coin that's been "called in" is not legal tender. The government wants to phase out the plastic card that displays your social insurance number, and Bill C-38 makes the necessary changes to existing laws so it is no longer required. Canadians will still have SINs, they just won't be carried on a plastic card. The age of eligibility for OAS will rise gradually to 67 from 65 starting in 2023. C-38 lays out a complicated chart showing how that change will be phased in.